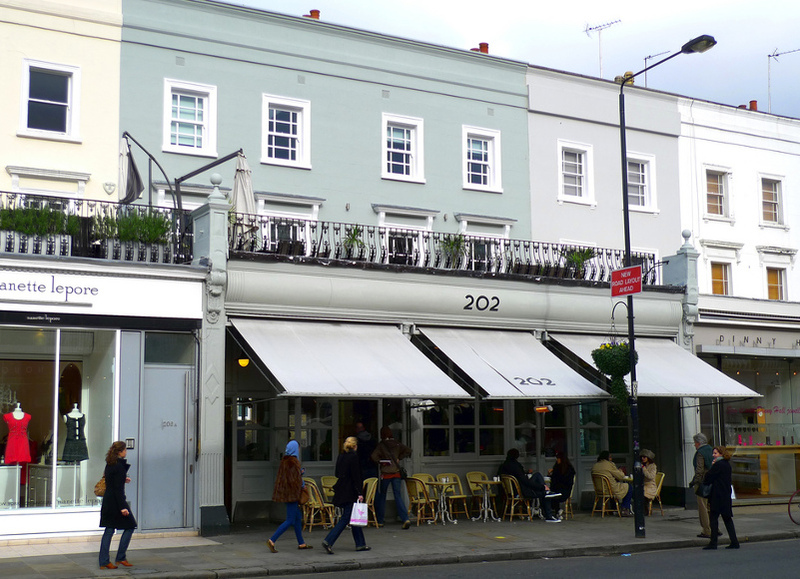 On the elegant Westbourne Grove Avenue, perpendicular to Portobello Road, 202 is home to both a designer boutique and coffee shop, in a contemporary and airy space. Taking advantage of its natural light and convivial tables, local families love to meet here for tea, lunch or dinner. On the menu are traditional bistro recipes – Caesar salad, fish & chips, a lamb burger with goat cheese – as well as Mediterranean-inspired dishes, like pumpkin risotto with sage and mascarpone, beef kofta with eggplant, yogurt and couscous, or chicken fajitas with grilled peppers, guacamole and sour cream. For a lighter meal, we love the healthy and gourmet brunch dishes on their “202 Healthy Breakfast” menu, including avocado, tomato and spinach toast, and a salad topped with a poached egg. The atmosphere is chic but casual – strollers can easily be parked at the table and pots of crayons and drawing sheets await the little ones. On their menu? Fish nuggets or pasta, plus the desserts they’ll enjoy from the regular menu (chocolate pie ; apple, rhubarb and plum crumbles ; caramel ice cream ; sorbets). The restrooms, located in the basement, have changing tables, as well. Les Louves loves the ambiance here at any given hour; it is always quiet and welcoming. Arrive early in the summer to enjoy the small courtyard terrace that sits just below the restaurant. Granger and Co, for its irresistible pastry menu. Daylesford, a chic, ethical and organic grocery store, selling products directly from the owner’s farm in Gloucestershire. You and your children can even sample their seasonal products at the on-site restaurant (208-212 Westbourne Grove , London W11 2RH). The adorable, Spanish boutique “Nano’s,” with flowy dresses for little girls and perfectly cut, linen blazers for boys (183 Westbourne Grove , London W11 2SB). Checklist : Children’s menu, Coloring books and crayons, Changing table, Space for strollers, Small courtyard terrace. No high chairs.